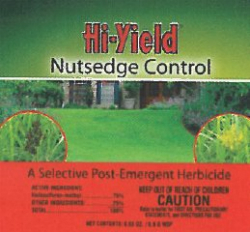 A selective post emergent herbicide that can be used in landscaped areas or lawns. Easy to apply by taking the water soluble bag containing the water dispersible granules and dissolving completely into 1 gallon of water in a spray container. Add 2 teaspoons of nonionic surfactant (we recommend Hi-Yield Spreader Sticker) to the mixture and stir well. The surfactant helps penetrate the waxy layer of the Nutsedge leaf thereby facilitating absorption into the weed. Use mixture the same day it is blended--do not store-diluted mixture, as it will degrade. Pets and people can return to area when completely dry. Product is rainfast within 4 hours of spraying. For best results, do not mow for 2 days before or after treatment.